Rip was born in and grew up in Pittsburgh, PA. In high school he would play football, baseball, and basketball. In football he would earn ALL W.P.I.A. honors. He then attended Wichita State University where he would receive All-Conference honors as an end on their football team. Rip would then go into the military service and get an honorable discharge in 1945. Following his tour of duty with the military he would play one year (1945) of professional football with the Pittsburgh Steelers. Following this from 1946-1951 he would be the Athletic Director and head football, basketball coach at St. Mary’s High School in Wichita, Kansas. 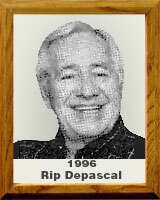 In 1953 Rip came to Tucson and became an assistant football and head basketball coach at Amphitheater High School. He would also become an outstanding football and basketball official for the Border and WAC conference along with high school and junior college officiating in those sports. He served as the Baseball Commissioner for the Arizona Interscholastic Association (A.I.A.) from 1965-1968. Rip co-produced a Football/Basketball Game of the Week radio program for local high schools; produced the Sports Round-up of all scoring throughout the state of Arizona. He was also the Assistant Editor of a Tucson Community weekly football and basketball program. From 1971-1988 he coached the Amphitheater High School Golf Team. He would teach and coach at Amphitheater High School for 35 year. He was inducted into the Amphitheater Athletic Hall of Fame in 1988. In his retirement years he became very active as an officer and member of the Southern Arizona Retired Coaches and Officials Association.